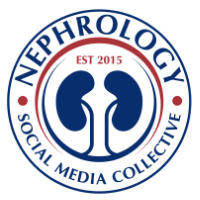 This week we discussed a case of malignant hypertension with acute renal failure and Thombotic microangiopathy secondary to the severe hypertension. We discussed in detail Hypertensive Retinopathy. Here are some of the saliant features discussed on rounds. 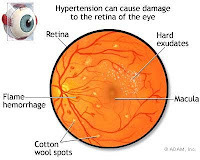 There are different stages of HTN related changes in the retina. The first stage leads to small degrees of arteriolar narrowing and an increase in arteriolar tone due to local autoregulatory mechanisms. As the stages progress, you get more and more narrowing and hyperplasia of the medial wall and sclerosis. Final stages lead to exudative changes leading to retinal ischemia and formation of cotton wool spots, hemorrhages and microaneurysms. Swelling of the optic disc is the final sometimes noticed on physical exam finding of severe hypertensive urgency. How is this different from atheroscloertic changes in the retina? There are four stages and these can also be seen in HTN Retinopathy. Stage 1 is defined as a broadening of the light reflex from the artery, with minimal or no arteriovenous compression (earliest sign of retinal artery atherosclerosis). Stage 2 is defined as changes similar to those in Stage 1, but more prominent. These narrowings are called AV nicking. In Stage 3, the arteries have a “copper wire” appearance, the arteriovenous compression is much greater, and serious atherosclerotic changes of the retinal arteries are present. In Stage 4, the arteries have a “silver wire” appearance, and the arteriovenous crossing changes are the most severe. Stage 4 is the most severe form of atherosclerosis of the retinal arteries. So as Nephrologist or Internists, Do we actively take the time to look at someone's eye? An ophthalmoscopic exam is the least we can do and we should all do that in our hypertensive and diabetic patients because as we do more of these exams, the better we get at picking up more clues and more educated and timely referrals to Ophthalmology.